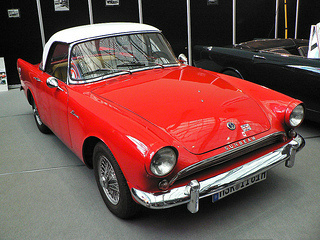 The Sunbeam Alpine Series 1 sports car was replaced at the October 1960 Motor Show, following a production run of only 12 months in which 11,904 units were built, by the Series 2 model, which would remain in production until February 1963. The Series 2 received some minor alterations to the rear suspension, which involved an increase in the width of the leaf springs, together with larger dampers. However, some of the features of the Series 1 were retained, such as vinyl seats, a padded dashboard, and adjustable panels, as were the optional extras of wire wheels, an aluminium hardtop, a fitted occasional rear seat, and overdrive. Furthermore, in addition, the Series 2 now offered an increase in engine capacity from 1494 to 1592 cc. The 4-cylinder, overhead valve, in line engine retained a 9.1:1 compression ratio and, with its slotted alloy pistons, aluminium head, and two Stromberg 36 carburettors, would produce 80 bhp at 5000 rpm, and 94 ft/lbs of torque at 3800 rpm. The Series 2 still retained the distinctive rear fins of the Series 1, due to the fact that this sports car was specifically designed for the US market. The driving position was improved with the addition of both an adjustable steering wheel and seat position. Since the length of the car was only two inches shorter than that of a Big Healey, this meant that there was plenty of interior space. The Alpine's chief rival, the MGA received, in the 1961 model, a larger engine of 1622 cc with an associated increase in output and torque. However, for use in competitions, this now placed the MGA in the 1600-2000 cc class, so that it was no longer a threat to the Alpine. Furthermore, Rootes Group established a works racing team and, in November 1961, Stirling Moss and Jack Brabham had a notable success driving an Alpine at the Riverside Raceway, in California. In order to make the Series 2 more attractive to those customers seeking performance, Rootes manufactured their own tuning equipment that was available through spare parts outlets. On top of this, they even published their own tuning guide, entitled: "The Sunbeam Alpine Series 2 Special Tuning". Finally, in 1962, Alpine production was transferred from the Armstrong Siddeley factory back to one of the Rootes' plants. Thomas Harrington Ltd was a Rootes Group distributor and a well known firm of coachbuilders that had branched out into working with fibreglass. The company was confident that a market existed for a coach built version of the Alpine fitted with a fixed hardtop, made of fibreglass, that would be classified as a fastback, which was quite unique. When the Harrington Alpine sports car was launched in March 1961, Rootes Group gave their consent for it to be marketed solely through Thomas Harrington Ltd.
As an optional extra, this model was available with three stage of engine tuning, which would be carried out by George Hartwell Ltd, another Rootes distributor. Furthermore, the Stage 2 factory tuning option increased the engine's output to 103 bhp at 6000 rpm. In order to convert a standard Alpine convertible into the fixed head coupe, the rear of the car was removed and replaced with a fibreglass roof panel, which incorporated a small boot, in the early models, to a larger hatchback style with a wide rear window, on the later models. Soon after the launch of the Harrington Alpine, Rootes asked the Harrington Company to modify one of their cars so that it could be entered in the 1961 Le Mans 24 hour race. The resulting sports car finished the race in 16th position overall, and in 2nd position in the 1600 cc class. This Harrington variant created so much interest that it was presented at the 1961 Motor Show as the Harrington Le Mans. This model featured a hardtop that extended from the windscreen to the rear bumper, with access to the rear via a tailgate. Over a period of three years, Harrington built around 384 cars which were designated as Harrington Alpines, Harrington Le Mans and the "C" Series of Alpine. The "C" Series Harrington sports car was first introduced at the Earls Court Motor Show in October 1962, but production ended in February 1963. It has been estimated that some 150 Harrington Alpine GT's were built, together with at least 250 of the Harrington Le Mans. 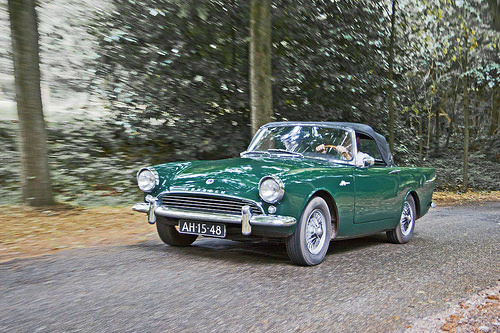 A 1960-63 Sunbeam Alpine Series 2 in good condition would fetch in the region of £2000/$3,000 to £3000/$5,000. On the other hand, a rarer 1962 Series 2 Harrington Alpine in excellent condition would command in the region of $30,000/£20,000 to $40,000/£25,000.